We woke Thursday morning to the sound of gerbils. Angry, evil, little warbley gerbils. (Yes, that’s a word. If it in any way conveyed the throat-rattling, turkey gobbler-like sound they made, it did it’s job. It’s a word). You might think gerbils are these cute, cuddly little creatures, all soft and innocent, but I’m here to tell you they’re not. And I would apologize for the language, but it was early and they were annoying and we are sailors, so … I make no excuses. Okay, so you have probably figured out by now that they weren’t gerbils. They were birds. 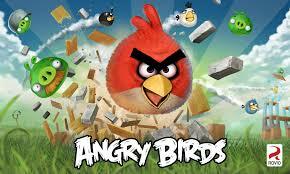 Angry birds. I’ve since learned this particularly noisy breed tends to inhabit lots of marinas and they like to wake you up at four in the friggin’ morning with their warbley, sock-wrestling mating calls. 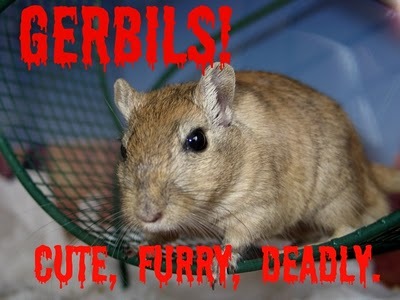 Effin gerbils! 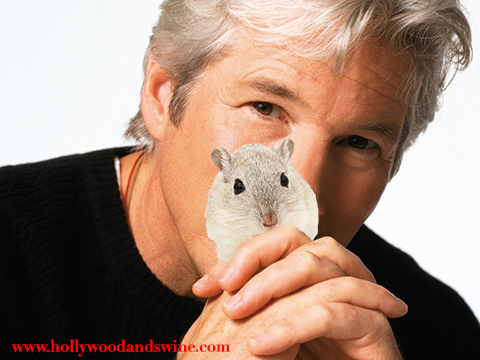 And, just as an interesting aside (so you get the benefit of all my hard blogging work), every time I Googled for images of gerbils, Richard Gere kept popping up. Yes. The actor. 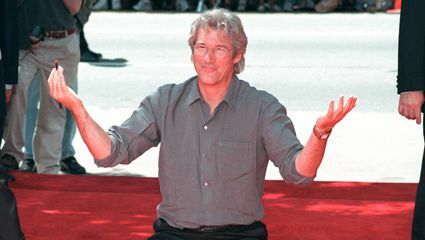 Richard Gere. I mean, every time! There were even pictures of him with gerbils. Richard … you old dog, you! And, to add icing on this glorious cake (and this will be my last mention of ole’ Richard, I swear), Phillip got a big kick out of the fact that I had never heard this “gerbil rumor” before and had to conduct an independent investigation. I guess my age is showing. As several of you reminded me after my last post, I am, in fact, younger than MTV (http://www.cnn.com/SHOWBIZ/Music/9807/31/encore.mtv/). So, the angry birds did deny us a nice, leisurely rousing that morning, but it wasn’t too much of a sacrifice as, if you recall, we had planned to wake up early and get under way before sunrise. Gerbils, or birds or angry roosters, we were ready to jump out of the v-berth regardless and get our beautiful boat a-goin’. 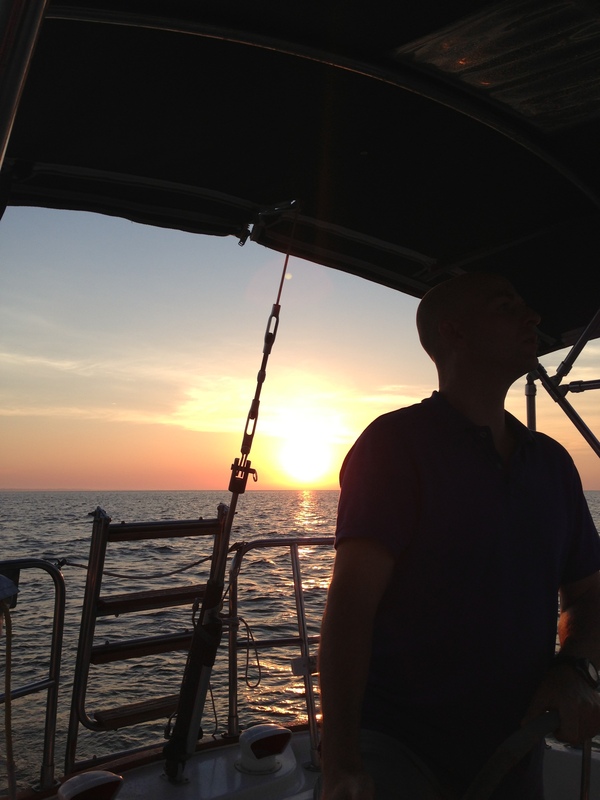 Or it seems that is how sailing can make you feel sometimes. Like the world is spinning just for you. And, this time it was just Phillip and I. Me and the captain, off on our first couples cruise. I was feeling like one incredibly lucky gal. I mean, could life really get any better? Perhaps just a little, with a warm mug of heavenly hazelnut coffee I suppose, but just a little. 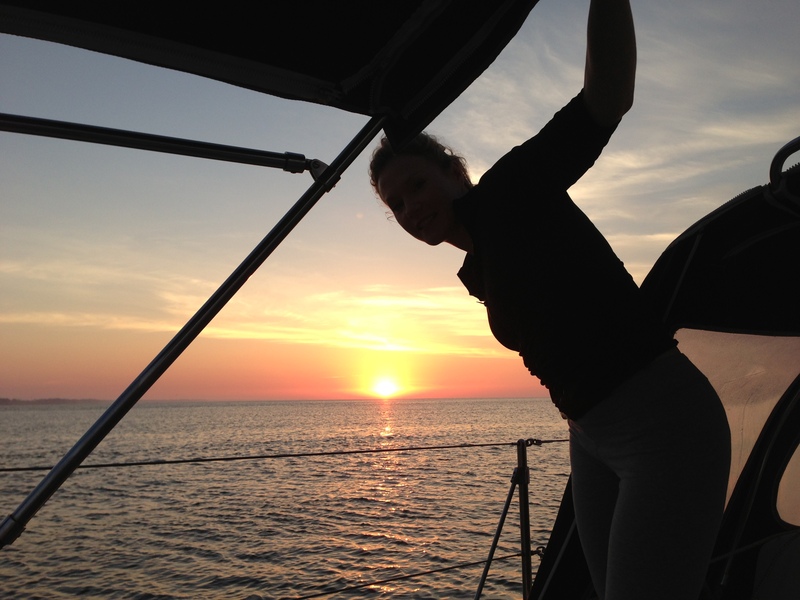 We brewed up some coffee and enjoyed the sunrise, and the sail, and the feeling of finally having her back out there in blue waters, headed home. There wasn’t much wind, so we were motoring most of the morning, but I could have spent all day in that cockpit, holding the helm, or curled up with a book (or my laptop!) just watching the water float by. I was perfectly content. But, that’s why I’m only the first mate and Phillip is the captain. Thankfully, he had the wherewithal to think to check on the engine. I mean, she had been sitting for a month, she just had a new transmission put in, and we had been running her for about an hour and a half. 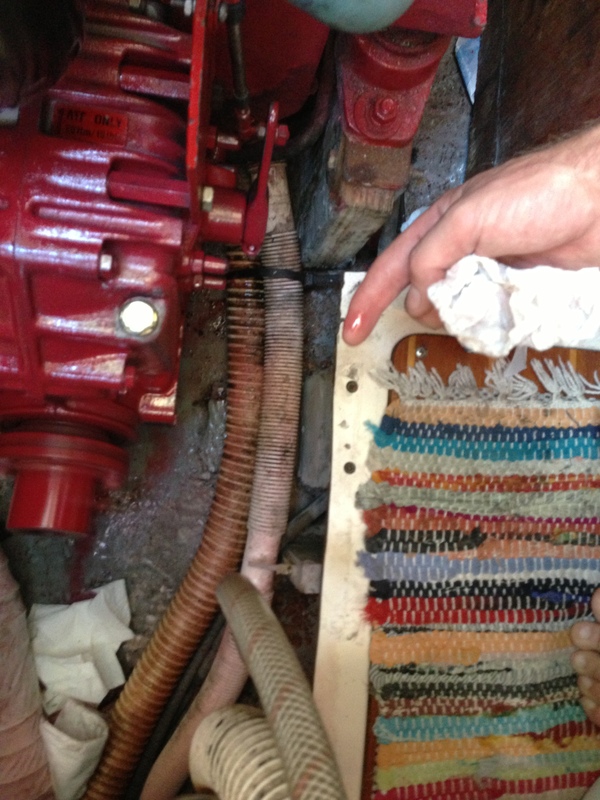 And, the cool part is the sink hoses are all long enough and run in a manner that doesn’t require any unhooking, etc. to pull the sink back. 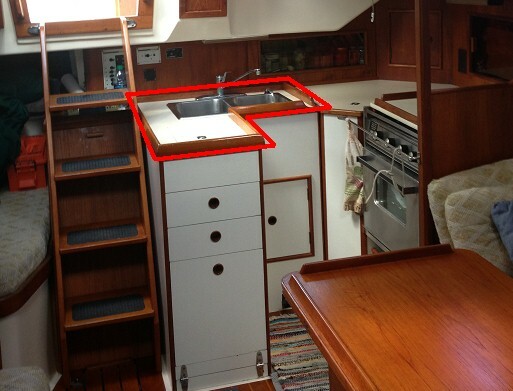 You just pull it back, lean it gently against the table (we put a pillow in between to cushion it), do your business under the “hood,” then tilt her back down gently in place, and the sink is none the wiser. 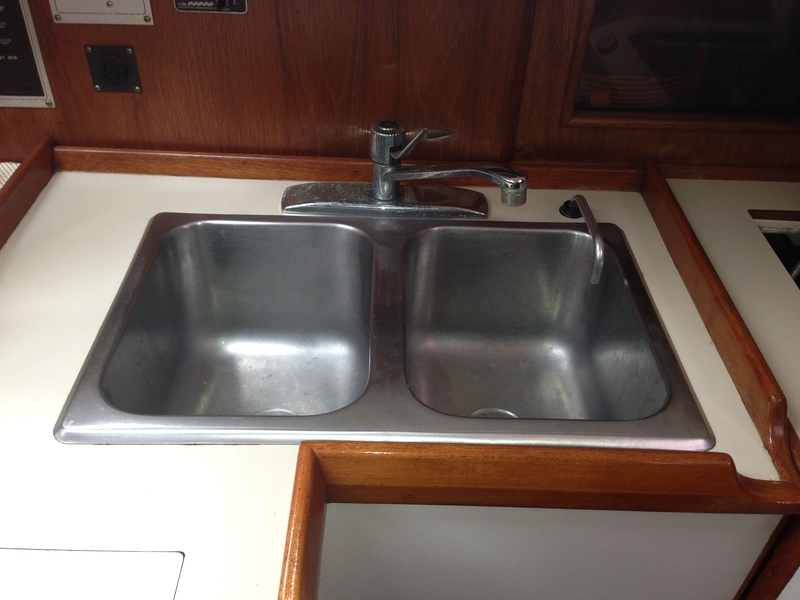 It’s really quite handy and, unlike many other boats which require removal of covers, plates, hatches, screws, etc. 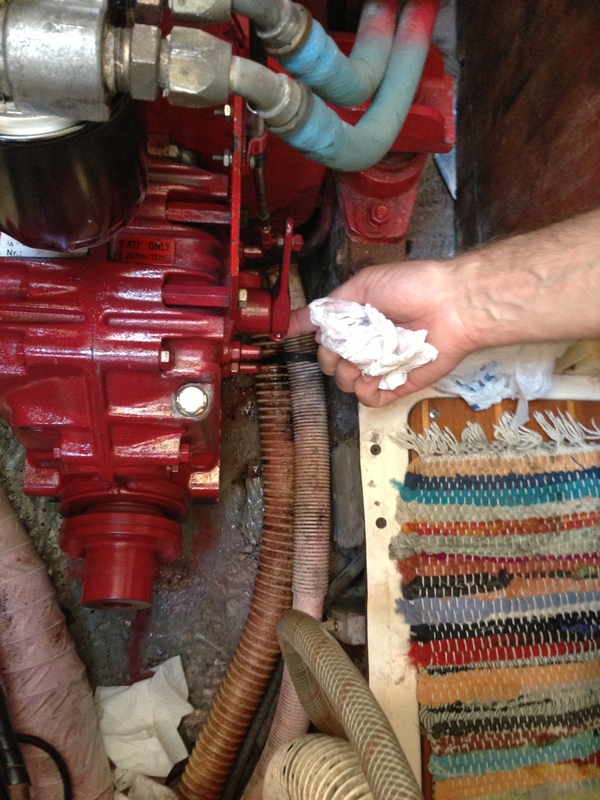 to get to the engine, this little “flip-top” contraption makes for very easy access when you’re underway. I tell you all of this because it was a feature we were about to become incredibly familiar with and incredibly thankful for. As I held the wheel, I could hear Phillip down below pull the sink back, set it against the table and click on a flashlight to take a look at the engine. I saw his light moving in and around the engine and I could hear him wiggling some things and tinkering around. I wouldn’t have thought much of it had his silence not continued for just a little too long. Minutes passed and he he didn’t pop his head up and give me a thumbs up, or say “Everything looks great,” or “Good to go,” or anything like that. He was just quiet. Too quiet. I wanted to ask him how everything was going, but I knew he’d tell me when it was time, and a part of me didn’t want to know. 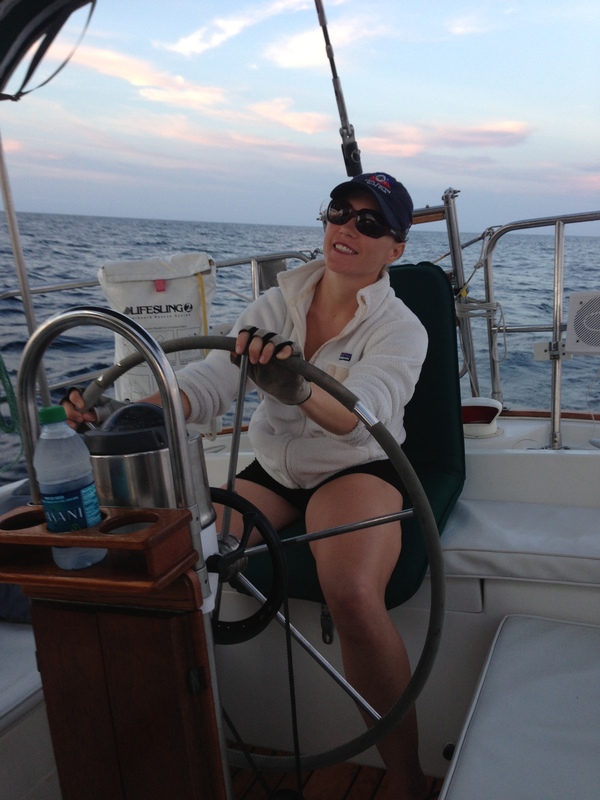 I was perfectly content to sit up there at the wheel, watching the water dance by, pretending we didn’t even have an engine, or fluids, or any of that. But, Phillip finally raised his head in the companionway and gave me the exact look I was fearing. Something was wrong. He told me to put on the auto-pilot and summoned me down. I came down the stairs, and he handed me the flashlight without saying a word, which worried me even more. 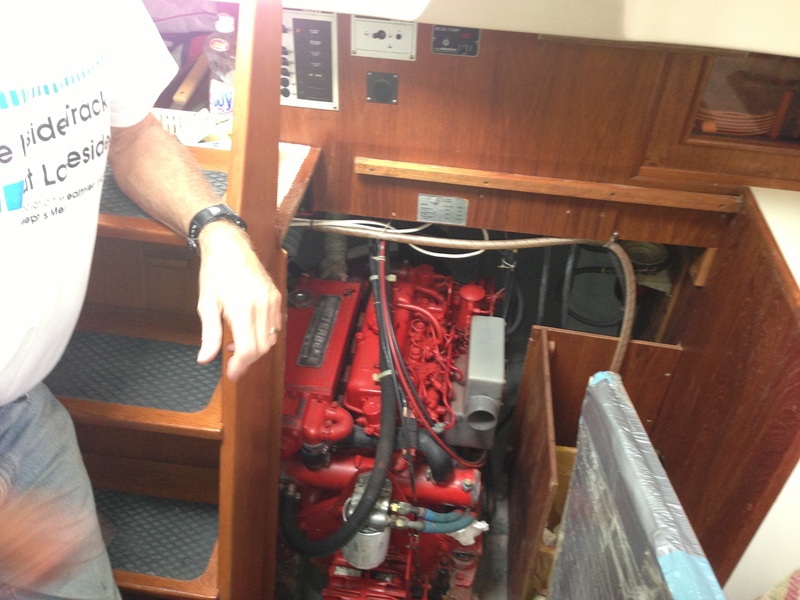 Although after the initial leg of The Crossing, I was certainly far more familiar with the engine than I was before, I was no diesel mechanic. 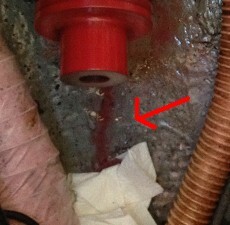 If the problem was obvious enough for me to SEE with my naked eye, it was probably bad. And … it was. 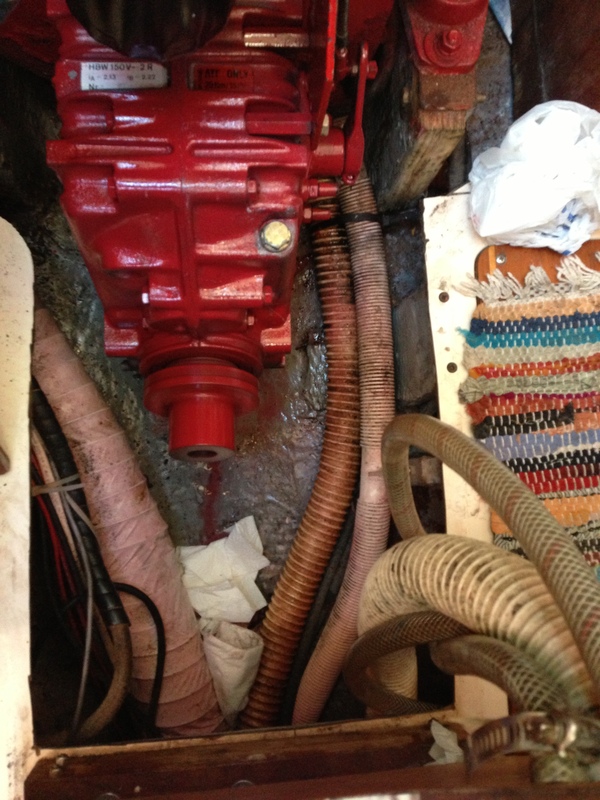 Underneath the engine and slithering on down to the bilge was a bright, pink trail of fluid. 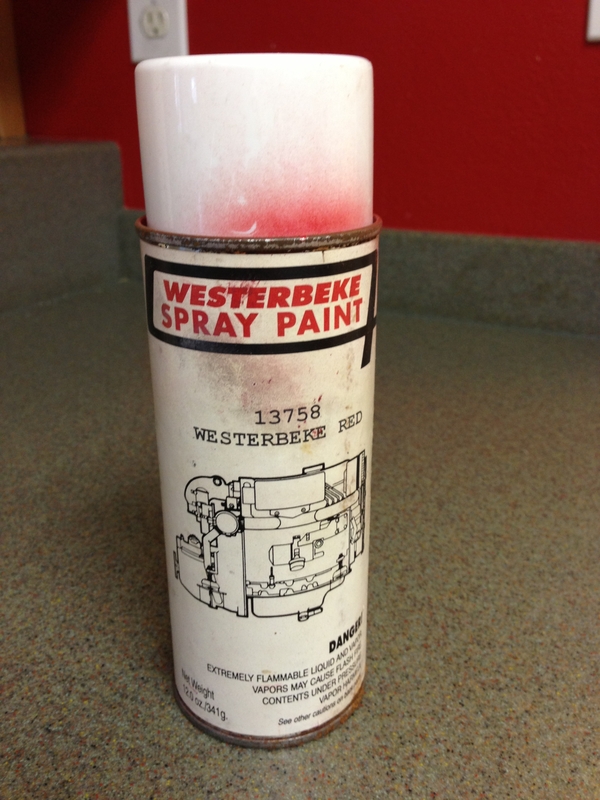 Phillip and I were hoping it was just some of that famous Westerbeke Red paint Mechan-Eric had sprayed on the transmission to make it match the rest of the engine. Little red drops kept forming, one after the other, under the shifter arm, and falling to a grey grave below in the bilge. There was no denying it. 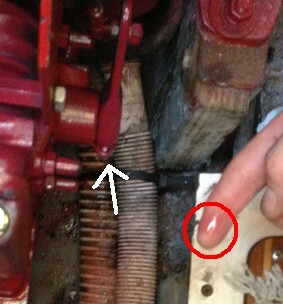 Our brand new, bright red, painfully expensive transmission was leaking. We were two hours from Carrabelle, twelve hours from our next stop, with little wind and only a half quart of transmission fluid to get us anywhere. 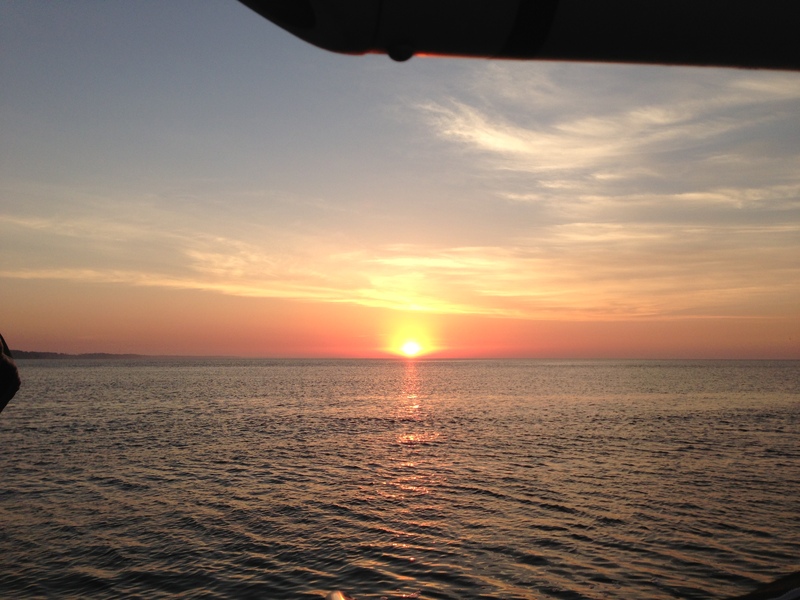 I felt like I could have cried too, a little red trail of tears right down to the bilge. This entry was posted in Engine Issues, Gulf Crossing and tagged angry birds, carrabelle river, diesel engine mechanic, engine access, gerbils, gulf crossing, niagra, richard gere, shifter arm, transmission, transmission fluid, transmission leak, urban legends, westerbeke engine. Bookmark the permalink. and falling to a grey grave below in the bilge. Sums it up pretty nicely. Needs a little format tightening, but I’m digging the vibe. Get zen with it! Very haikuy. Yes, I say it’s a word. Better stock up on some sorbant pads. Needs format tightening? I’ll show YOU what needs tightening. Some screws of yours that’s what. I’m kidding. Glad you enjoyed the Haiku-edness. And, sorbant pads?? I died laughing at that one. You make them sound like Pampers (which I guess is pretty much what they are and is exactly what we stocked up on after this incident). You are a keen one! Sorbent pads are a lot like Pampers, but it depends.